The bottle gourd (Lagenaria siceraria), lauki, ghiya or doodhi came to fame when a few years ago, Baba Ramdev advised people to drink lauki juice to take advantage of its several health benefits. It is not surprising, the lauki juice soon found a pride place in many juice stalls. What are the health benefits of drinking bottle gourd juice in diabetes, weight loss, etc. and its side effects. But there are some reports of deaths due to drinking bottle gourd juice. So the natural question comes to mind, is bottle gourd juice is a healer or killer? Read on the following to find health benefits of bottle gourd juice and its side effects or toxic effects, if any. The bottle gourd is prescribed as a general tonic, a therapy against high cholesterol and diabetes in Ayurveda. In a scientific study, L. siceraria was found to possess radical scavenging capacity which makes it effective as hepatoprotective, antihyperglycemic, antihyperlipidemic, immunomodulatory and cardiotonic agent [1-3]. Bottle gourd contains contains Vitamins C, Vitamin A, Thiamine, Riboflavin, Niacin, Folate; and more than 90% water. It also contains minerals like calcium, iron, potassium, magnesium, phosphorus and zinc. Due to its high nutrition, lauki and its juice has been advocated by traditional healers for many health benefits. improving digestion, constipation, diabetes, urinary tract infection, etc. Some of these claims are supported by Scientific studies highlighting the beneficial properties of bottle gourd on human health [1-3]. Cooked bottle gourd is low in calories, high in dietary fiber, diuretic and soothing to body. It is generally given to a sick person. Half a cup of cooked bottle gourd contains only 8 calories, so it is good for people trying to lose weight. Warning: Bitter lauki juice can kill you, it can be poisonous. There are reports that a few people died after consuming bottle gourd juice, due to suspected toxicity of the juice. A few years ago (until 2011) limited information was available on the adverse effects of drinking of lauki juice. After that, the detailed study on the toxicity of bottle gourd juice revealed that if the bottle gourd is not bitter, then it is non-toxic. But it becomes harmful and can cause serious side effects, if it is bitter . 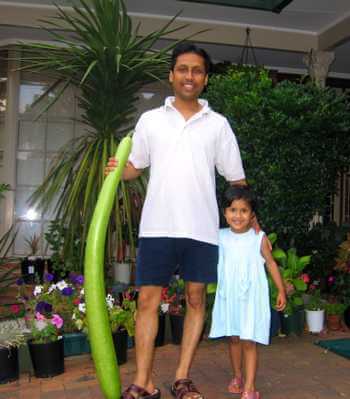 According to the research, a bitter bottle gourd has a high toxic component called Tetracyclic Triterpenoid Cucurbitacins, which may cause symptoms, such as diarrhea, vomiting, nausea, liver damage, gastrointestinal bleeding, inflammation of the pancreas and eventually multi-organ failure [4-6]. This compound is responsible for the bitterness in vegetables like cucumber, eggplants, melon, zucchini squash, pumpkin and gourds. There are a few rare cases of poisoning in the Medical literature. In 1994 several school children in London developed gastrointestinal illness when they consumed bitter cucumber. In 2003, a farmer in the US developed diarrhea after he ate bitter zucchini squash. In June 2010, Mr Sushil Kumar Saxena, a deputy secretary in the Council for Scientific and Industrial Research in New Delhi died due to consumption of bottle gourd juice on empty stomach. He was however, drinking hte juice for 4 years to cure his diabetes, but on that day, the juice was bitter . The scientific study suggests to consume only the cooked bottle gourd . A bitter bottle gourd should never be used even after cooking. Drinking uncooked bottle gourd juice or eating raw bottle gourd may be dangerous to health. Even if the bottle gourd is not bitter in taste, its juice may not be consumed more than 100 ml and should not be mixed with any other juice. Drinking over 200 ml of bitter bottle gourd juice may be fatal, even consuming 50 ml may produce side effects and complications. The side effects of bottle gourd may be discomfort, nausea, vomiting or any feeling of uneasiness after consuming bottle gourd juice. In such cases, you should seek immediate medical attention. Taste small pieces of bottle gourd from both the ends to ensure that it is not bitter. Do not consume bitter bottle gourd juic, either pure or mixed with any other juice. In case of the symptoms of vomiting, diarrhoea, nausea or any feeling of uneasiness after the consumption, immediately rush to the nearest hospital. 1. J R Deshpande, et al., Beneficial effects of Lagenaria siceraria (Mol.) Standley fruit epicarp in animal models, Indian Journal of Experimental Biology, Vol. 46, April 2008, pp. 234-242. 2. Deshpande JR, Choudhari AA, Mishra MR, Meghre VS, Wadodkar SG, Dorle AK. Beneficial effects of Lagenaria siceraria (Mol.) Standley fruit epicarp in animal models. Indian J Exp Biol. 2008;46:234–42. 3. Ghule BV, Ghanta MH, Upaganlawar AB, Yeole PG. Analgesic and anti-inflammatory activities of Lagenaria siceraria Stand. fruit juice extract in rats and mice. Pharmacognosy Mag. 2006;2:232–8. 4. S. K. Sharma, et al., Assessment of effects on health due to consumption of bitter bottle gourd (Lagenaria siceraria) juice, Indian J Med Res. 2012 Jan; 135(1): 49–55. 5. Jolt to Baba’s bottle of juice - If it tastes bitter, don’t touch it, The telegraph, Wednesday , October 26 , 2011. 6. A Sukhlecha, Bitter bottle gourd (Lagenaria siceraria): Healer or killer? Int J Nutr Pharmacol Neurol Dis 2012;2:276-7.